AVLock Simple is a simple and powerful licensing component. Automatize online the whole licensing cycle namely: Start trial, extrend it, purchase, activate and optionally move the license to another computer. May be used into a removable disk. 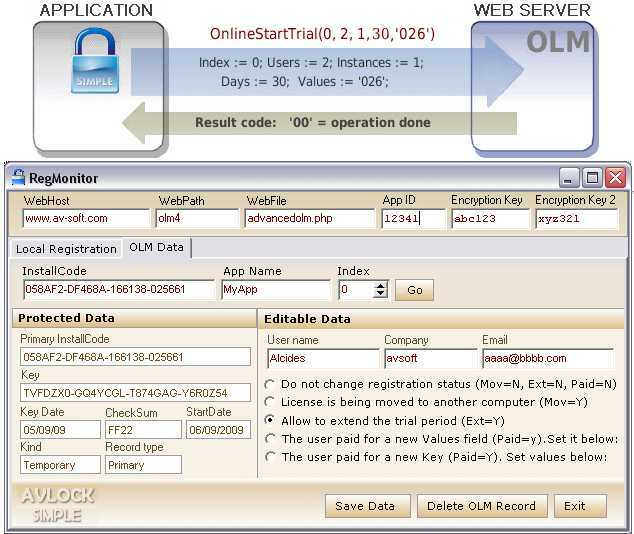 Allow to achieve the licensing operations offline through registration keys. Allow to register each computer at independent way into a network environment, and much more. * The user activate the application. * The user optionally moves the license to another computer. * Allow to achieve the licensing operations offline through registration keys. * With your application installed into a network, allow to register each computer at independent way. * Allow to manage the number of concurrent user for your application into a network environment. * Allow to configure your application to be installed into a removable disk like a pendrive, memory stick, etc. implements a simple but proven method of learning spelling words. Balance your checkbook, keep track of credit cards, manage bills, and more. Burn regular music CDs from MP3 files- The Simple Way! Qweas is providing links to AVLock SIMPLE 5.1.3 as a courtesy, and makes no representations regarding AVLock SIMPLE or any other applications or any information related thereto. Any questions, complaints or claims regarding this application AVLock SIMPLE 5.1.3 must be directed to the appropriate software vendor. You may click the publisher link of AVLock SIMPLE on the top of this page to get more details about the vendor.